A destination firmly on the rise, Belfast is the capital and largest city of Northern Ireland. Known for its history and culture, it has played host to a number of world class events in recent years and is the perfect host for Routes Europe 2017. 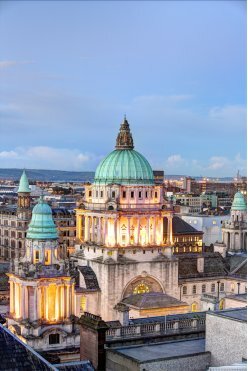 Strategically located between the USA and Europe, Belfast is serviced by two airports, George Best Belfast City Airport and Belfast International Airport. Both airports have seen considerable growth, welcoming over 7 million passengers in 2015. Belfast International’s passengers increased by 9% to almost 4.4 million, while Belfast City’s passenger numbers increased by over 5% to 2.7 million. With almost €3 billion of investment in the last decade, Belfast is now ranked as the UK’s second most attractive city for foreign direct investment, particularly in the technology and financial services sectors. This influx of investment has ensured that the enhancement of air connectivity is at the forefront of the executive’s agenda in recent and coming years. Belfast’s tourism industry has blossomed over the past decade and it currently contributes around €600 million to the economy, a figure that the city aims to double by 2020. Routes Europe is an important part of Belfast’s strategy to achieve this aim, as the event will showcase this vibrant and rejuvenated city.